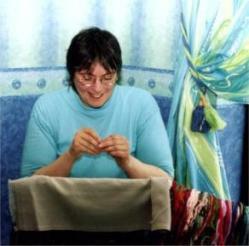 ﻿I thought an excellent approach to introducing this needle felting tutorial would be to share this photograph. During a damp country walk at the weekend I found sheep's wool in the hedge. I retrieved some and tucked it in my pocket. During the remainder of the walk the warmth and friction caused it to start felting by itself. It is suggested the felting process was "discovered" by someone placing the fleece inside their shoes and then walking on it. 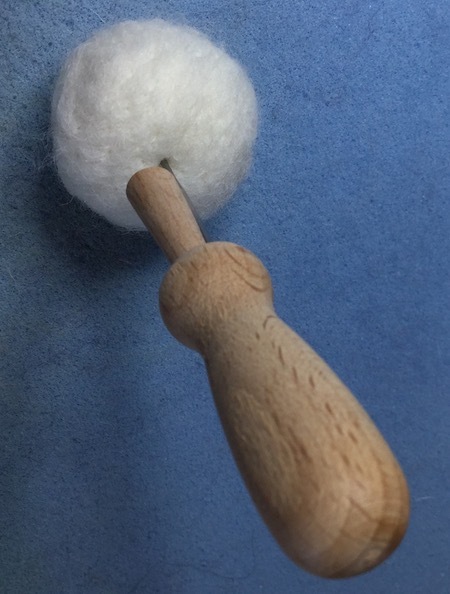 With needle felting we cause the friction by stabbing the wool with a notched needle. This tangles the fibers together with no need for moisture. But how do you go from a clump of matted sheep's wool to a 3D sculpture that resembles an animal, person or other object? To those who haven't attempted the craft this appears a mysterious, indeed magical, transformation. So let's see how it happens. 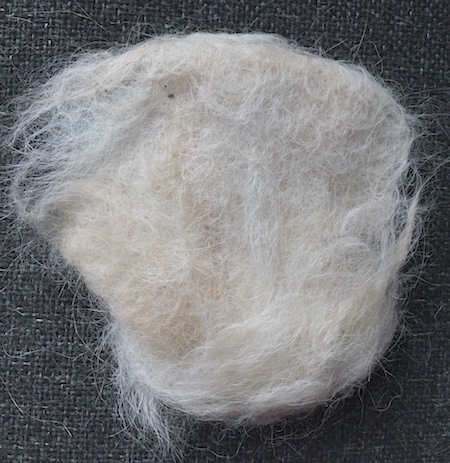 The photograph displays a ball, egg, and cylinder, which comprise the primary forms for 3D needle felting. I will walk you through creating a ball, below. Note that the cylinder on the right, has a "fuzzy" section at the top. This helps to secure it to another shape to build up the structure of a model. 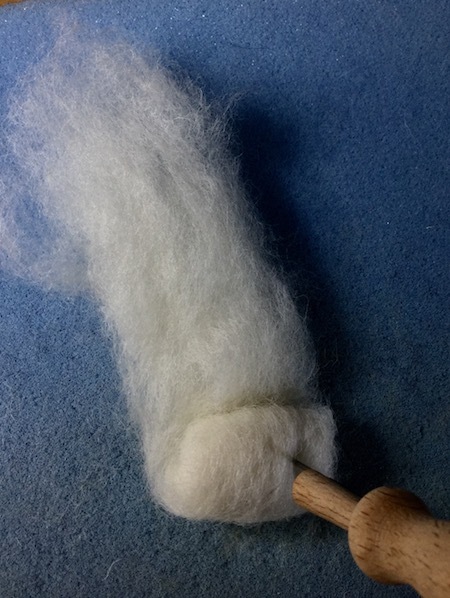 Start by pulling off a narrow strip of core wool and selecting a coarse felting needle. 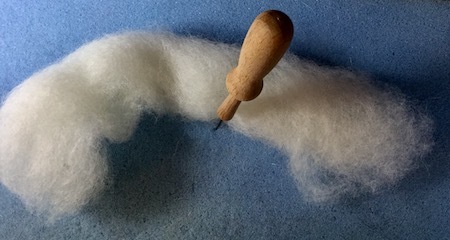 Beginning at a short end, roll the wool into a ball on the felting surface. In the photograph I have secured it with a needle as I required both hands to take the photo. Try to tuck the sides in as you go, to produce more of a sphere rather than a sausage shape, but don't panic, as you can fine tune this when you stab it with the needle. You just need a rough resemblance of the shape you are wanting to achieve with the initial rolling. The next photo shows the wool rolled up and prepared for felting. Needle felting needles are sharp! Always be sure that you can see where your fingers are to reduce the risk of stabbing yourself. 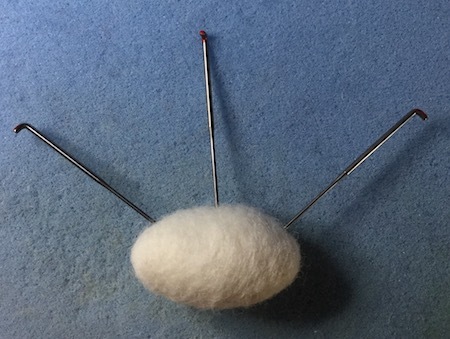 ﻿This part of the needle felting tutorial involves poking the full depth of the notched section of the needle into the wool and then drawing it back out in the same direction. Do not alter the angle while the needle is in the wool or it may break. Continue stabbing, while turning the ball after each insertion of the needle, so it becomes rounded rather than flattened. You can help the shaping by rolling the ball in your palms and then stabbing again. ﻿You should end up with a sphere. Be forewarned, this is NOT a rapid process. My shape took 10 minutes to needle felt. You want to aim for a shape that is firm but has some give to it when you squeeze it between your finger and thumb. 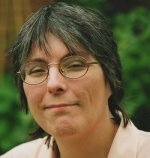 Try to ensure there are no soft areas that are less felted than the rest. You don't want it too hard at this point, so that it can be joined to other shapes to create your completed sculpture. The direction in which you poke your needle will determine the shape. Just try to squash as much air out as possible when rolling the strip, to speed up the process of felting. At each end of the egg aim your needle towards the center of the egg, so it will go in (and come out!!!) at a diagonal angle. This will taper the ends to create the ovoid shape. As this is difficult to explain in words, the following photo may show it better. The shape will compact in the direction in which you stab. 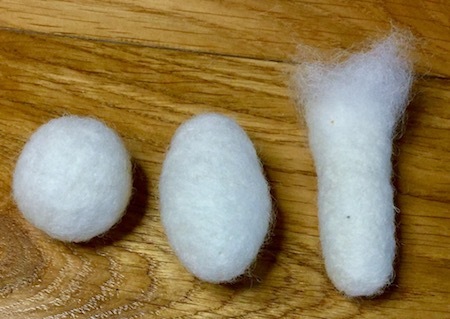 Cylinders or tubes are perfect for the legs, necks and tails of your needle felted animals. 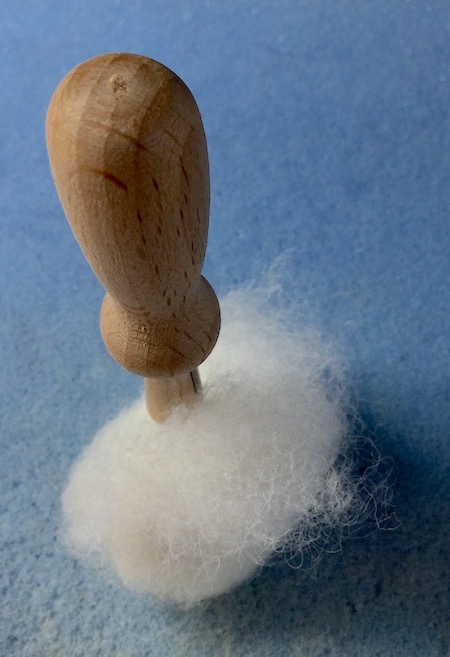 For a cylinder you want the width of the strip of wool to be a little wider than the length of the required finished shape, as it will shrink during the felting process. The process is rather like creating an elongated egg. The middle section will not be tapered, however, only the end(s). As mentioned earlier, if you will be attaching your cylinder to another piece of the sculpture leave one (or both) ends unfinished to facilitate joining. We will cover ways of joining sections together in my needle felted bunny tutorial.